ATTACKS ON STREET MINISTRY MUST END! (Calgary) The Calgary Drop-In Centre and Street Church Ministries are neighbours and co-workers in the quest to deal with Calgary’s burgeoning homeless population issue. Despite this fact, there have been growing attacks from the Drop-In Centre against the Street Church. Street Church volunteers have been forced from the building for talking to the poor or even just announcing that there is free food available for them. Also, Street Church volunteers have been verbally and physically assaulted by Drop-In Centre employees, and Drop-In Centre staff have mistreated homeless patrons for talking to, or even shaking hands with, Street Church Volunteers. Street Church feels that they have been discriminated against, since hundreds of non-Street Church volunteers a month are allowed to come and go from the Drop-In Centre without harassment while Street Church volunteers are not. "Our volunteers are courteous and do not cause problems when they go into the Drop-In Centre. Their interest in entering the Drop-In Centre is to help the poor. There are needs that the poor have which the Drop-In Centre is not providing for, either due to lack of ability or lack of will. We make up the difference, and provide something extra along with it, love for the ‘unlovable’, and hope for the ‘hopeless’. It is shocking, the way that the Drop-In Centre staff discriminate against Street Church volunteers. The goals of both groups should harmonize and yet there is this aggressive treatment of our people. It is simply not acceptable that volunteers are arbitrarily singled out, and that some patrons of the Drop-In Centre are punished for having any contact with Street Church. ", said Bogdan Stobiecki, Spokesman for Street Church Ministries in regard to this human rights case. Street Church says that they have many volunteers that are willing to testify to the abuses that they, both received, and witnessed upon entering the Drop-In Centre. Some volunteers have stated that they were suddenly not welcome in the Drop-In Centre after becoming Street Church volunteers. "Recently a southern Alberta family, who were long time volunteers with the Drop-In Centre – bringing food to the poor, in an effort to teach their children compassion for the homeless, were ejected from the building when staff realized they had also chosen to be Street Church volunteers. This is completely ridiculous, there is no reason for it. It is senseless and ruthless bigotry. ", stated Bogdan. Due to the ongoing abuse, that has been happening for years now, Street Church has filed a human rights case against the Drop-In Centre and against Dermot Baldwin. Dermot Baldwin has been included in the case due to evidence that demonstrates that this mistreatment comes as a direct mandate from Balwin himself. "It has come to our attention by testimonies from Drop-In Centre staff members, that Dermot Baldwin gave specific instructions to kick out anyone associated with Street Church. I am not sure what motivates him to treat us with such unbalanced and unfair treatment, but it must stop. The only difference between our volunteers who are ejected from the Drop-In Centre and other volunteers, who are not, is that we not only take care of the poor, but we also preach the good news of the Gospel. 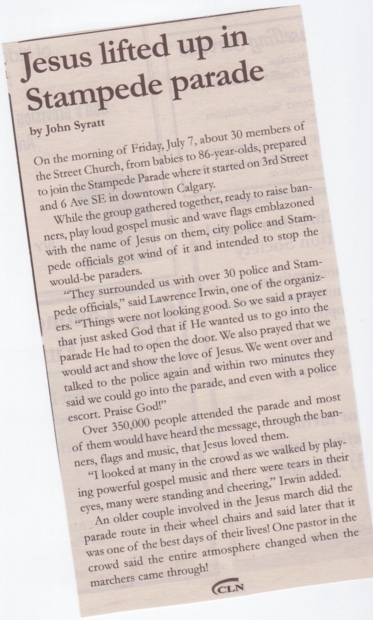 The Drop-In Centre should not be allowed to demonstrate such blatant bigotry"
Any press or media representative can get further details by calling Bogdan Stobiecki and Street Church Ministries at (403) 607-4434. ← Are Calgary Courts City Bullies?